I guess you could say I'm a linen hoarder because when I see a pretty duvet cover, decorative Euro shams or an Egyptian cotton sheet set for a fantastic price I have a really hard time not buying it to store in my linen closet. Before David and I got married I had several bed linens, tablecloths and cloth napkins. I take after my mother, I guess, who has an entire walk-in closet full! 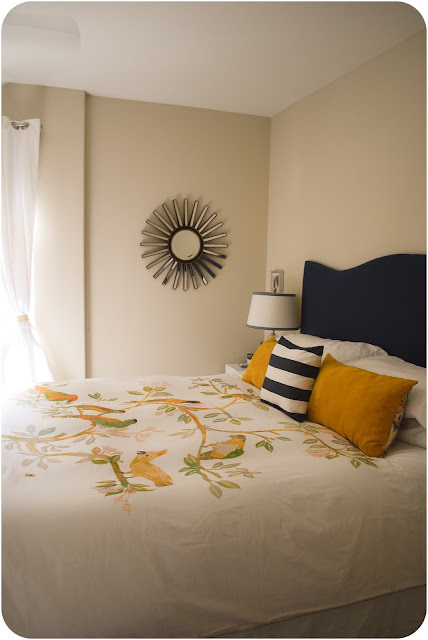 It's amazing how much the feel of our bedroom changed when I swapped our plain white duvet cover for this aviary one that I got on super sale at Anthropologie a few months ago (+ a gift card = score!). Then I flipped my pillows and tied back my curtains and had an entirely new room! It feels a bit "Springy" for Autumn, but doesn't the gold remind you of Autumn leaves? It is really pretty! I think it has a rich look for fall rather than a light, airy spring look. Lovely, Liz! You certainly have a flair for decorating and you give me courage to shop in places I wouldn't think to shop (thrift stores, IKEA, etc.). I need to help my son move into an apartment next year and he has nothing and a limited budget. So the challenge begins--with your inspiration. Thanks! Buying new bedding is definitely my addiction as well. Something about a new duvet makes everything seem right with the world. You have inspired me to do a switch up. That is beautiful! Wish I had a husband who was up for seasonal decor changes!! I really love this. I need you to have talk with my husband about the wisdom of hoarding linens.